Will I Be Looking for Investors? It takes money to make money, and you need to consider where your initial funding will come from. 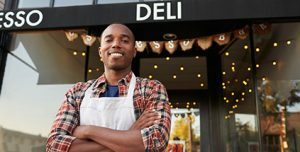 If you have savings, assets or investments, you may wish to use them to start your own business, but you’ll be putting your personal assets at risk. Another option is to look for investors. If you decide to do that, you need a plan for how to pay the funding back. Keep in mind, too, that some investors want a say in how you run your business to ensure they get a return on their investment. Another option is to bootstrap your business, meaning starting small and paying for business expenses as you go. This way, you retain control of your business and don’t have to pay anyone back. However, bootstrapping can slow growth initially. Will I Be Renting a Space or Working From Home? Renting office space can make your business look more professional and help you separate your personal assets from your business assets. However, it can also add considerably to expenses, especially if you decide to renovate. Creating an office at home can be less costly initially. However, you’ll need to evaluate your homeowners’ insurance policy to ensure you have coverage for your business. Do I Have a Budget? You need a solid business plan and budget that covers everything from advertising and business cards to buying materials for inventory. Tally up all the costs it takes to start and run your business and figure out whether you have the savings or investment you need to start. Am I Ready to Be Compliant? Your business may need to be registered, licensed or insured. Some businesses require certifications, and there may be other mandates in your industry requiring paperwork, fees and more. Speak to an attorney to ensure you’re fully compliant with all relevant local and state laws. Do I Understand the Industry and Market? Before you launch a business, you need to research the competition, potential customers, customer needs and your industry. You should have an excellent understanding of what it takes to succeed in your location and industry. Starting a business is a big step, and we have the resources to help make it a little easier. Money Help Center can help you calculate the future value of your investment or business. We can also assist with budgeting and other financial decisions as you start your new company.